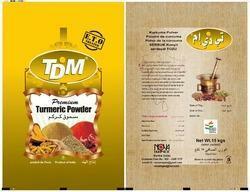 Providing you the best range of spices packing bags with effective & timely delivery. As an affluent name of this domain, we hold expertise in offering high quality Spices Packing Bags to our clients. These bags are made available in a variety of sizes and load bearing capacities. Clients can also provide their custom requirements according to the needs. The standard sizes available in the bags are 200g, 500g, 1Kg, and custom. Due to fabricated adhering to the food industry guidelines, these recyclable bags keep the spices fresh for a longer time.